A preview of Della & Andrew’s destination Riviera Maya wedding in stunning Playa del Carmen. The entire weekend was full of events I (and my co-pilot, Lu Zhang, representing Wagner & Co. Film) wouldn’t be able to shake until well after returning home. On Thursday, we opened up the weekend’s events with a pre-wedding portrait session at Banyan Tree Mayakoba in traditional Korean attire (hanbok) and poolside fun. Afterwards, we shuttled over to the welcome dinner at Patio 8 in Playa to meet Della & Andrew’s family and friends, many of whom traveled from New York and their native Korea. The next day, we joined the yacht party out in the waters of Puerto Adventuras and despite the madness managed to get back in one piece and rest up before the wedding day. Their ceremony at Banyan Tree Mayakoba was hilarious, heartfelt, and officiated by their close friend. Their reception at the Thompson Playa del Carmen was out of this world epic. They passed around hookah, laughed voraciously, partied hard, and invited us into their world as friends. 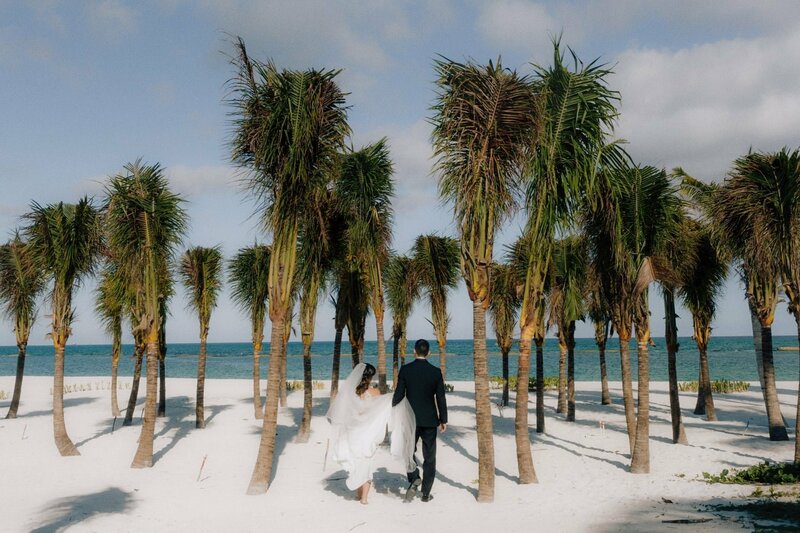 Their Riviera Maya wedding weekend was all glorious chaos. Here’s what we got up to. We grew up together in Seoul, Korea. We attended the same elementary school, but did not meet until middle school, during 8th grade. Andrew’s version of how we met is that he had a crush on me, but I wouldn’t give him the time of day. In reality, he had a crush on every single one of my girlfriends, and even tried to buy my best friend’s school picture off of his friend for $5. One weekend, said friend and I were going to hit the bars and invited Andrew and his friend to join. It was his first time drinking, and long story short, he and his friend got drunk pretty fast. Andrew and his family moved to Albany, New York, at the end of 9th grade, and it would be years before we thought of each other again.